The recruitment tactics of a far right group have been exposed after it was infiltrated by an undercover reporter. System Resistance Network (SRN) preaches zero tolerance to non-whites, Jewish and Muslim communities and says homosexuality is a disease. There are now calls for membership of SRN, which wants expulsion of minorities and a white revolution, to be made illegal. The group is believed to have been inspired by the now-banned far right group National Action and has inspired its followers to carry out arson and vandalism in Welsh cities. After creating a fake online profile, a BBC Wales Investigates undercover reporter gained first-hand experience of how SRN operates. He communicated with the group for months and gained their trust enough to be asked to carry out acts on their behalf - putting up SRN posters at night and taking pictures of them to prove he had done it. He was also told to read Adolf Hitler's Mein Kampf and other extremist literature. "They talk about smashing the establishment," he said. "They want me to break the law - to get their name in the headlines - they don't care who gets hurt." 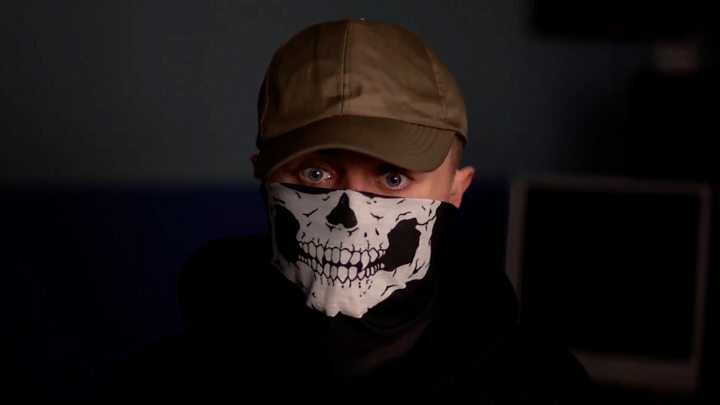 One of National Action's founders, Swansea-based Alex Davies, has been giving his support for the group on Neo-Nazi radio station, Radio Aryan. He was a student when he first created National Action in 2013. His media man, Ben Raymond moved from Bognor Regis to live in Swansea as the group's numbers and infamy grew. National Action was considered the most dangerous far right organisation in Britain and was outlawed in December 2016 after glorifying the murder of Labour MP Jo Cox. Just over a year ago Mr Davies and Mr Raymond were both arrested on suspicion of continued membership of National Action, something they deny. They have not been charged. Police say their investigations are continuing. "As long as there's some signs of resistance then there's hope," he said. "It's like a fire. As long as you've got some embers burning all you need is to put some fuel on that fire and it can turn into something big very quickly." Mr Raymond has also made appearances on the station asking for support for far right supporters who have been jailed, in particular to send them reading material. BBC Wales approached the man who runs Radio Aryan, who calls himself Sven Longshanks. He declined to be interviewed but contacted the programme by e-mail to deny any wrongdoing and said the station was for nationalists to listen to in the privacy of their own homes. He added that he was not responsible for anything that Ben Raymond or Alex Davies say on his programmes. Ten people have been convicted this year of continued membership of National Action. Counter-terror police said they maintained their links and took the group underground. Earlier this year, Christopher Lythgoe and Matthew Hankinson were jailed for a total of 14 years after being found guilty of being members of the group after a six-week trial. Fellow National Action members Adam Thomas and Claudia Patatas, who named their baby after Adolf Hitler, and Daniel Bogunovic, were also found guilty of National Action membership and will be sentenced later this month. One National Action member decided Wales was fertile ground not only to spread the far right message but to set up white enclaves. Mikko Vehvilainen was a lance corporal and fitness instructor in the Royal Anglian regiment. His neighbours in the village of Llansilin in Powys had no idea of his Nazi sympathies until a dramatic police raid in September 2017. Counter-terrorism officers discovered he was still an active member of National Action - and was linked to other members of the now underground group in the Midlands. In Vehvilainen's home, and his military accommodation at Sennybridge Camp, officers found Nazi paraphernalia, weapons and messages he had been exchanging with fellow far right sympathisers via encrypted apps. In one message he sent to a fellow far right sympathiser using an encrypted app the true extent of his hatred for other races was laid bare. The Afghanistan veteran said black people were not worthy of life and added: "I could shoot their children and feel nothing. I didn't kill any Muslims up close, but when I was involved in killing them it didn't bother me one bit. Maybe some of my shots killed them. I hope so." Vehvilainen was jailed for eight years for being a member of National Action after the prosecution at his trial successfully argued he had been trying to recruit fellow soldiers into the group. The trial heard he bought the house in Llansilin as part of a plan to set up an all-white enclave in mid Wales. Vehvilainen managed to infiltrate the British Army despite his extreme views, but in his native Finland his sympathies were well known. BBC Wales Investigates travelled to the Baltic state to meet Esa Holappa, a former neo Nazi who turned his back on the movement where he had been in regular dialogue with Vehvilainen. "Mikko was a very hateful person, willing to fight and struggle for his ideas and maybe take another step," he said. "It was very, very clear that according to MV's ideas and the ideology he followed... certain people could be exterminated and killed in order to achieve a white revolution, the white victory." Esa was not surprised that Vehvilainen joined the Army and said it was a known tactic for racist groups. The Army told BBC Wales Investigates it vets recruits for convictions or links to extremist groups and has robust measures to ensure those showing extremist views are not tolerated or permitted to serve. Stephen Doughty, MP for Cardiff South and Penarth, said SRN - like National Action - should be outlawed. He also wants the police to investigate Radio Aryan and comments made on it by Alex Davies and Ben Raymond. Ben Raymond denied any wrongdoing and declined to be interviewed. The programme also made repeated attempts to reach Alex Davies but he did not respond. They believe they have a right to their views and free speech. "This is free speech that is too damaging for the rights of others," said Mr Doughty. "You cannot have liberty to impinge on the liberty of others and a lot of these organisations hide behind that when in reality they are allowing disgusting and hateful content to exist. "It is also about the penalties for technology and internet companies that continue to host this content when it has been reported to the authorities." "The ideology and intention has not changed - it's the tools that are available for criminality in all its forms to exploit," he said. "What I'd say though is it's also an opportunity for us to investigate and it doesn't matter whether people are trying to radicalise online or offline, if the offence is there we will investigate and bring people to justice." Security Minister Ben Wallace said: "The government will not hesitate to proscribe any organisation that poses a threat and work is underway with tech companies to combat extremist propaganda online."